The Arctic Ocean is capped by a dynamic layer of sea ice that grows each winter and shrinks each summer, reaching its yearly minimum extent each fall. 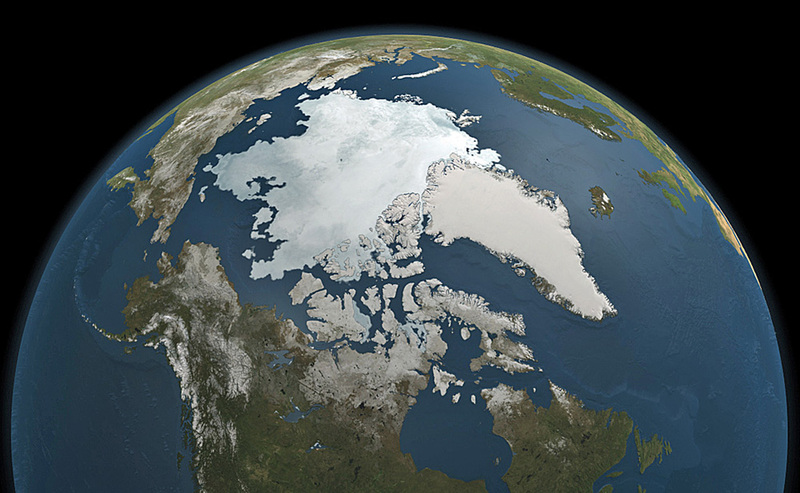 NASA's Aqua satellite used microwaves to capture this snapshot of Arctic sea ice on September 3, 2010. The yearly minimum had not yet been reached, but past history says the low point should occur sometime in mid-September. Perhaps what is most striking in this picture is the extent of the Greenland icecap—almost the whole island is overlain by a huge and deep (almost three miles deep in places) sheet of ice. The Greenland icecap averages almost a mile in thickness and contains about 10 percent of the total ice mass on the globe.